Juice has gotten a bad rap. We’re often advised to eat whole fruits and vegetables—for the fiber and because they are lower in calories than an “equal” amount of juice. But for the many Americans who don’t eat the recommended three to five servings of vegetables and two to three servings of fruit daily, juice can be a lifesaver—literally. Juice is loaded with nutrients that protect against heart disease, cancer, diabetes, arthritis, Alzheimer’s and other chronic conditions. Opt for fresh juice, not packaged. Packaged juices, whether in a can, bottle, carton or frozen, are lower in nutrients. And packaged juices have been pasteurized, which destroys health-­giving compounds. Example: Fresh apple juice contains ellagic acid, an anticancer nutrient that shields chromosomes from damage and blocks the tumor-causing action of many pollutants. In contrast, commercial apple juice contains almost no ­ellagic acid. If you juice more frequently, consider investing in a “slow juicer” ($300 and up) that typically operates at 80 revolutions per minute (RPM), compared with the 1,000 to 24,000 RPM of a centrifugal model. (I use The Hurom Juicer.) A slow juicer expels significantly more juice and better preserves delicate nutrients. And because the damaged compounds produced by a centrifugal juicer taste a little bitter, a slow juicer provides better-tasting juice. Follow this basic juice recipe: Use four unpeeled carrots and two unpeeled, cored apples cut into wedges as a base for creating other juice blends by adding such things as a handful of kale, spinach, radishes and/or beets. Ideally, use organic fruits and vegetables. If not, be sure to wash them thoroughly. Keep blood sugar balanced. Fruit and vegetable juices can deliver too much natural sugar, spiking blood sugar levels, a risk factor for heart disease, diabetes and other chronic conditions. What you need to know: The metabolic impact of the sugar in a particular food can be measured using the glycemic index (GI)—how quickly a carbohydrate turns into glucose (blood sugar). But a more accurate way to measure this impact is with the glycemic load (GL)—a relatively new calculation that uses the GI but also takes into account the amount of carbohydrate in a specific food. Beets, for example, have a high GI but a low GL—their carbohydrate is digested quickly, but there’s not a lot of it. Charts providing the GI and the GL are available on the Internet. I like those at Mendosa.com. 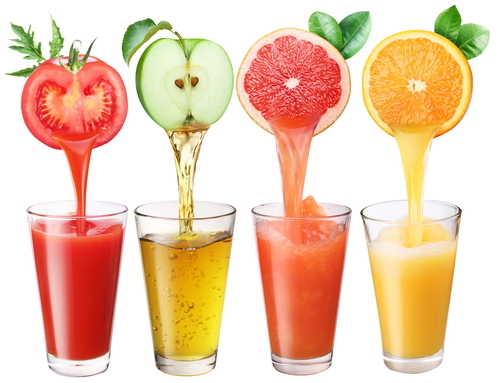 Bottom line: Limit the intake of higher-GL juices such as orange, cherry, pineapple and mango. You can use them to add flavor to lower-GL choices such as kale, spinach, celery and beets.